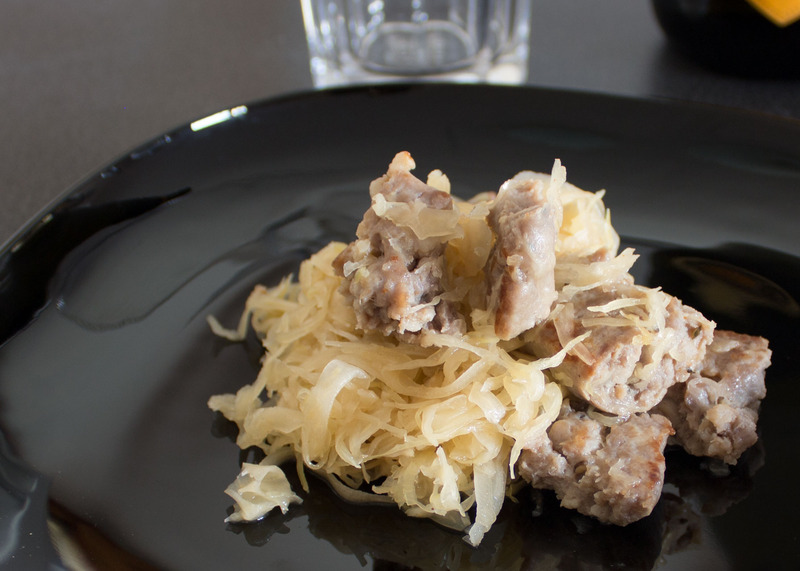 This dish might sound german, but also italians especially from the northern regions, were eating it in the past, along with the variation that has Savoy cabbage instead of sour krauts. I don’t know at which point and why we decided to dich this dish, since it perfectly fits for both summers and winters thanks to its flexibility to be eaten at warm or room temperature. Moreover, the sourkrauts have a huge amounts of vitamins (C and A, but also others), minerals and posess a lot of other positive properties for your health. Anyways, I really love sourkrauts, and they conveniently sell them in a can, fermented and ready for serving, which makes them perfect for a quick recipe with sausages. Cut the sausages in two (1), remove the peel and roast them in a pan. Italian sausages usually are salty and do not require any adjustment, but feel free to add salt if needed. Let them roast both sides in their own fat at low temperature, until browned but not burned (2). Don’t move them too much or they’ll break, and don’t drain the excessive fat, we’ll use it to counter the acidity of the krauts and to give enough salt to the dish. Once cooked, add the sourkrauts and keep cooking until you get the right density and the desired warmth. Break the sausages into pieces with a non-metal fork (or if you use a metal fork, avoid to scratch the pan) and keep cooking mixing the krauts and the sausage. Take the pan out of the heat, let it cool a minute or two and serve, eventually with a fresh grind of pepper on top. 2. Cook them until roasted. 3. Add the krauts and break sausages into pieces. Easy. Simple. Incredibly tasty and healthy. I love to serve them with a side dish of grated fresh carrots, naturally sweet, to counter the acidity of the krauts even more.